How do you fit pointe shoes? The shoe should have strong shank. 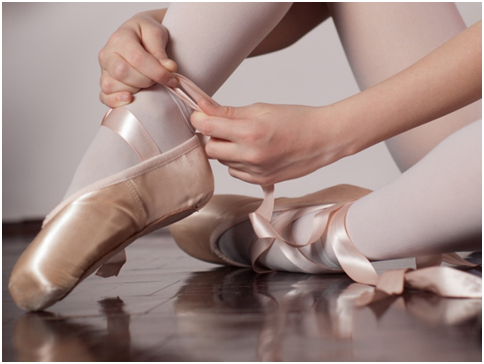 The shank of the shoe will assist in supporting dancing en pointe, especially if you have a very flexible arch. If you can slip a finger between your foot and the drawstring, the shoe is too wide. Flex your foot. If your heel is pinched painfully, the shoe is too tight. Is Proper Shoe Sizing Important? On a regular basis, we are asked if tight shoes or wearing shoes too small can cause foot problems. Dr Gibson has always said that shoe size will not cause foot problems, but will make problems you have a tendency for worse. In saying that, however, significant shoe size will cause problems. The best example of this is strapping of the feet in China to make the feet smaller. Severe problems exist in the feet in these cases. Shoe size, therefore, can cause similar problems if not correctly fitted to the feet. Even slightly tighter shoes can predispose a foot to bunion, neuromas, hammertoes, injury to nails, corns and calluses and other foor or ankle problems. Our recommendation is to have a properly fitted shoe that is appropriate for whatever activity you will be participating in.